Today I’m wearing a T-shirt from our local short track where The Conductor and I like to watch the Sunday night races in the summer. 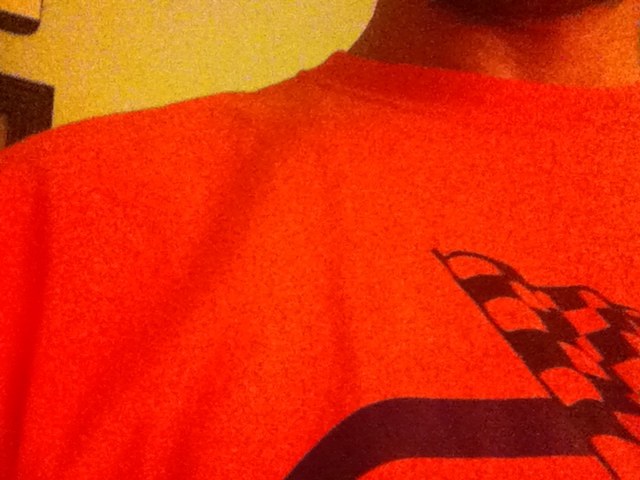 It’s bright orange, and my wife reluctantly acknowledges I look good in it. The world is what we make it, folks, and there’s much to be said for good branding. I’m usually pretty intolerant of such baloney. The best things in life outshine their names: Quarter-Pounder with Cheese. Monday Night Football. But on this autumn Monday with the gray (or is it Harbor Mist?) of winter marching steadily toward us, couldn’t we all use a little creative packaging? Staff meeting at 10? Call it a “Gathering of Serfs for the Pleasure of the Lord of the Manor.” Bonus points for telling your boss. 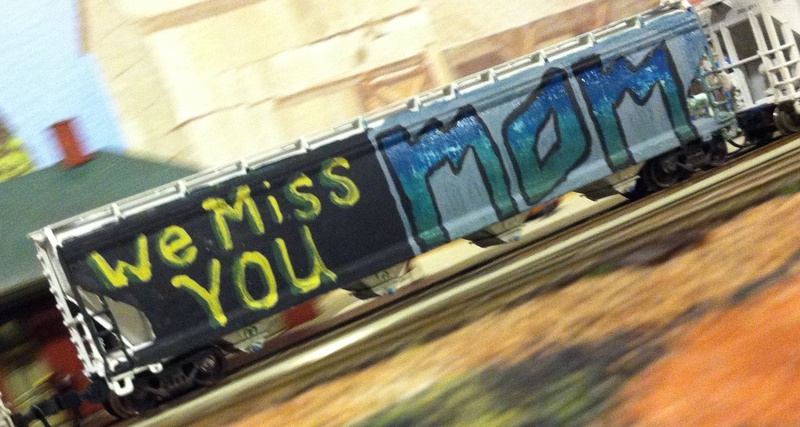 Branding our model railroads adds a layer of depth and realism. Rebranding the dreary helps us laugh it away. Mom died in May. It was unexpected, a heart attack I guess, and it came on the heels of a couple rough years that included knee and ankle surgeries that left her immobile for many months. But she was getting better, walking without a cane finally and driving herself to the Y and then for coffee and a $1 McDouble with her buddies. She was sixty-seven, and Dad had retired just three weeks earlier – timing that was terrifically cruel to him, in my opinion. Anyway, Mom knew me better than just about anybody else. We shared our joys and sorrows in a way only a Mom and son can. She understood from her own occasional darkness the melancholy with which I am sometimes tinted, and knew when to offer encouragement and when to shut up and let me be gloomy. She also embraced silliness. Reveled in it. She loved musicals – especially Fiddler on the Roof – and one night last winter I had “Sunrise, Sunset” in my head but couldn’t remember all the words. My sons and I got Grandma on the speakerphone and we worked through it until all four of us were belting it out in harmony: “I don’t remember growing older, wheeeennnn diiiiiiid theyyyyyyyy?” Then we said, “Love you Grandma” and hung up. She was always up for that kind of goofing off, and I’m smiling now remembering the laughter in her voice that night. A few weeks before she died, I was out and about for work and had a little time between appointments, not far from her and Dad’s house. Dad was off somewhere so we ate lunch together, watched Days Of Our Lives, laughed. I don’t remember much of what we talked about. It doesn’t matter. We just enjoyed being together, and that turned out to be the last time we had each other to ourselves. During that visit I told her I was thinking about naming a restaurant in Salvation Point after her. We talked about what it would be called, and what the sign might look like. 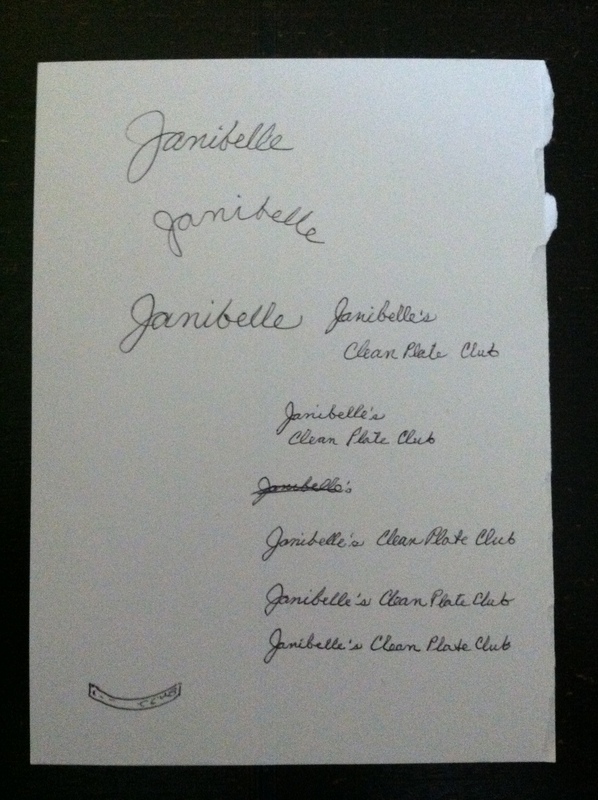 Before I left that day, I had her write her name and some of the restaurant names we’d played with on a scrap of paper. That scrap sat on my workbench for a few weeks. The night before her funeral, unable to sleep, I went down to the workshop in the wee hours of the morning and got to work. I took some thin copper wire – 22-gauge maybe? – and “traced” her handwriting by bending the wire with a fine needlenose pliers. Where the letters made angles too sharp to bend, I soldered pieces together (the “n,” the “i,” a few other spots). I also made solder joints where the wire crossed, like in the double Ls, to give the thing some stability. I then bent the whole assembly into a gentle curve and sprayed it turquoise – Mom’s favorite color. The plate and signature I glued to the Design Preservation Models building with CA (super glue). It’s not a good enough tribute to my Mom, but she would have gotten a kick out of it. 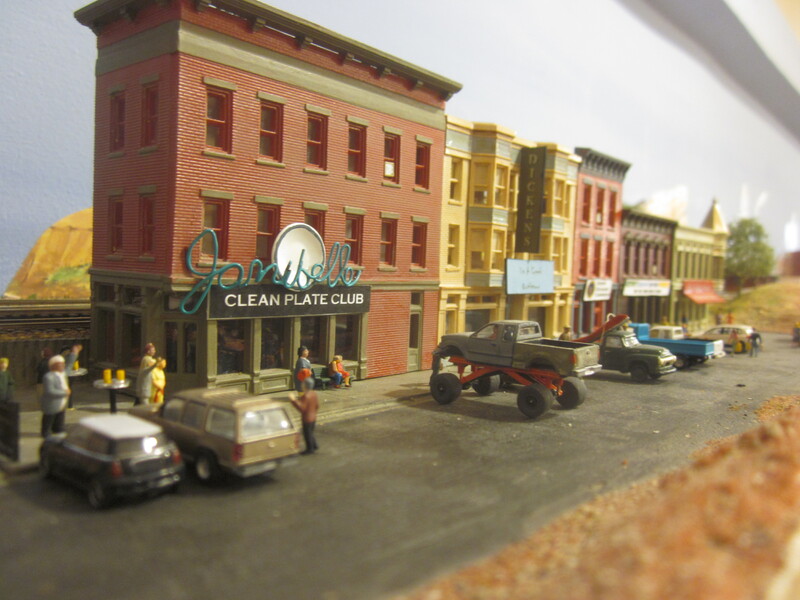 Janibelle Clean Plate Club serves Chicken Paprikash, Chicken Cacciatore, Beef Stroganoff, and darn good chocolate chip cookies – all just like Mom used to make. * It’s the only place I can get the stuff anymore. *In fairness, the secret to Mom’s chocolate chip cookies has been revealed – Dad made them. If you’re describing something that brings up the rear, you call it a caboose, right? And if your wife looks good in those new jeans, you might (carefully) tell her you like her caboose. It’s a useful term, universally understood. So when’s the last time you saw one? The FCFL is a modern railroad, and like it or not my trains are caboose-less. If you’re not familiar with railroads, since the mid-1980s the ends of trains in North America have largely been marked by “end of train devices” instead of cabooses. 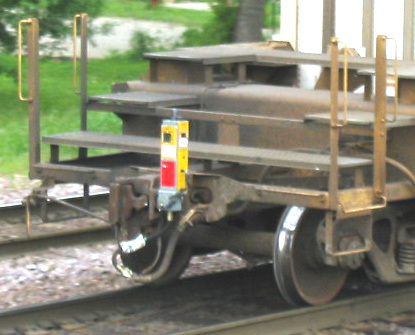 These are electronic boxes usually strapped to the trailing coupler of the last car to monitor the train – the pressure in the air brake lines – and send information by radio to the crew in the locomotive up front. I only vaguely remember cabooses, seeing them as a boy and occasionally waving to crews aboard them from the back seat at grade crossings. Most of my railfanning days are post-caboose, so I don’t miss them all that badly. But now and again, I get a hankerin’ for the old days. Plus, I’m planning to add a switching district, and my crews will be doing a lot of shunting and a good bit of waiting around. I think most railroads today use old cabooses simply as “riding platforms,” where crews doing a lot of switching and backing can stand on the platforms rather than hang on garbage-man style to the sides of the cars. I don’t like that idea. A whole glorious caboose, welded shut with only the porches put to use? No. The crews that will handle the Flagstaff turn are going to ride in style. A mobile office, with bunks and seats in the cupola and a pot of coffee brewing (though it is 2013 – maybe one of those Keurig things?). This project started with an Atlas Norfolk & Western caboose, $12.50 at my favorite hobby shop. I would have preferred a more modern “wide vision” caboose, but those are more pricey and I figured I could bring this one up to date. I disassembled the model and discarded the roofwalks, ladders and friction bearing trucks. I used Squadron White Putty to fill the ladder and roofwalk mounting holes, then painted everything Competition Orange. Once that dried, I painted the ends of the carbody and ends of the cupola blue. The roof got a coat of silver before I added safety stripes on the ends and the other decals, then weathered the whole thing with alcohol ink washes and some weathering powders. 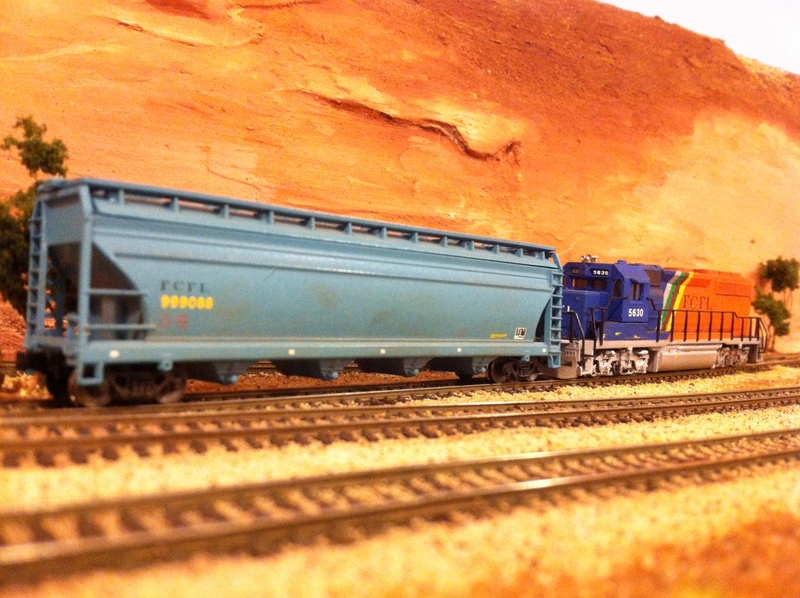 New running gear is a set of Micro-Trains 70-ton roller-bearing trucks and 33-inch Fox Valley Models metal wheels. 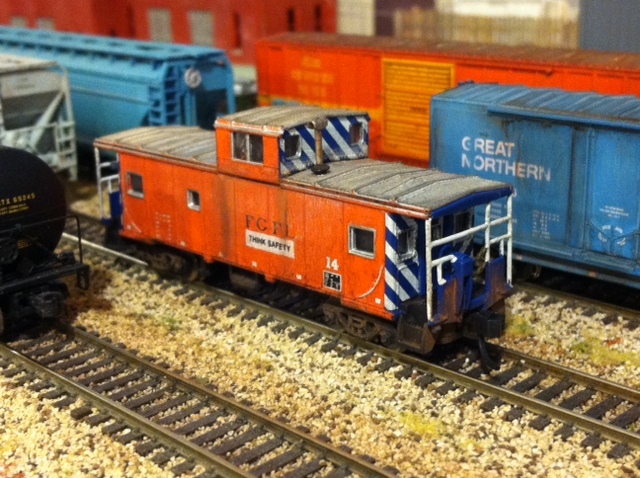 FCFL Caboose #14 waits for its next assignment at Salvation Point yard. The model is from Atlas, custom paint, decals and weathering, upgraded with MicroTrains trucks and Fox Valley Models metal wheelsets. Old No. 14 here might not get much use. Only when I’m in the mood, and only then to show the way on long push moves during switching. But I think it looks pretty good just sitting in the yard. Plus, my kids will know what a caboose is. The teenaged girl – thirteen, fourteen maybe – is good to her little brother. He’s about four and has been sitting on the train for too many hours and all he wants to do is run. She thumbs the screen of her phone with her left hand, squinting to see the display against the sunshine. Her right hand is extended casually to her right side, where the brother grabs the pinky with his fist and runs across in front of her. He lets go when he gets to her left hip and while he runs behind her she absently extends the hand to her right again, where he grabs it and the cycle repeats. A small kindness, playing this game with him while she texts or posts or tweets. Dad is looking after the bags while Mom is tying the shoe of another brother, six or seven, and Baby is starting to squirm in the holder on Mom’s chest. The platform at the Salvation Point depot is my favorite place to eat a cheese Danish and watch the people. There’s trouble today, though – the Federal Government is shut down and with it Many Lost Ways National Park. He nodded, looked up from his iPad, and sheepishly shut it off. “Work will be there when you get back you don’t need to check your e-mail during our family vacation you know what the doctor said about your stress level.” She said it all in one unpunctuated burst. So he promised, and enjoyed the train ride – they got the sleeping car with the nice accommodations – and now they are here and he doesn’t know yet about the shutdown. The daughter, she knows, there was something Aunt Kate posted on Facebook about liberals or GOPs or something but at thirteen you don’t connect that to your family vacation. And here Dad comes with the bags, grim-faced. He murmurs something to Mom and her shoulders sink, arms go up in surrender. Salvation Point is a town that supports The Park. It fills little holes of time – a movie theater for when it rains, shops and some nice restaurants, a pool at the hotel – but if The Park is closed indefinitely and you have a large number of what look like demanding children? I’m with you lady. Surrender now. I don’t have a point to make about The Affordable Care Act or right or left wings or whether the Federal Government should shut down or if it’s such a bad thing if it does. “A pox on all their houses” as my Dad would say. I look at this family and I consider everything they had to do to get here – spring the kids from school, use up a good chunk of Mom and Dad’s PTO, plan and save and pack – and my heart breaks for them. I can tell by looking that they are Involved. Sports, music, dance, scouts, work, work, work. Not necessarily bad stuff, but these people clearly have forgotten how to take it easy. A week without the Things the Brochures Told Them To Do could kill them. They will have to talk to each other and ad lib and sit on the floor and play matchbox cars and maybe put a couple puzzles together. Come to think of it, this could be the best trip of their lives. I hope they figure it out. “First time in Salvation Point, stranger?” the shuttle driver asks, taking my bag from my hand. I wince a little inside, because now I owe the man a couple of bucks, which I’m happy to pay, but I never carry cash. “Nope, just been gone a while,” I answer, taking the seat opposite the luggage rack so I can get up and grab my bag before he does, avoiding the awkward moment when he hands it to me and I hand him nothing in return. “What’s kept you away?” he asks, eyeing me in the rearview mirror and wheeling the bus out of the depot lot. I chuckle, but don’t answer. I let my head fall back against the rattling window and close my eyes. What’s kept me away? 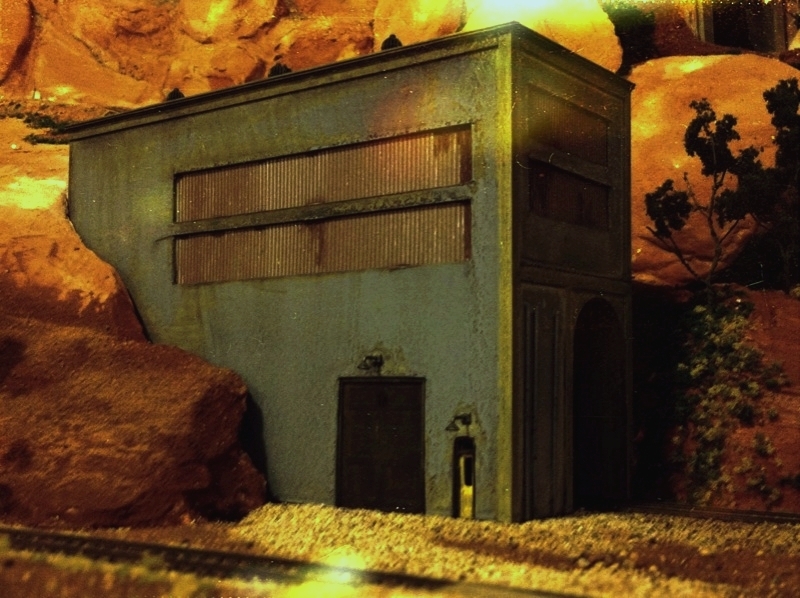 What’s kept me from writing about an imaginary town on a model railroad in my basement? Same thing that keeps me from remembering cash to tip shuttle bus drivers – an occasionally chaotic mind and a short attention span. Mom always said I was creative, a dreamer, seeing in me things only a mother can. (She died in May and I know that kept me away a little bit.) What she saw as dreaming, I experience as mental static. Background popping and buzzing that sometimes distills itself into useful thoughts, but most often distracts me from paying the gas bill on time. I used to blame elementary school, where the torment from a couple of mean kids drove me into a survival mode where I didn’t care about getting things done, just getting through – but now that sounds too victim-y for my taste. Lately I’ve been working on a theory that centers on a bike crash when I was in third or fourth grade. I was alone and skidded on loose gravel and fell, and I know I hit my head and I’m quite sure I lost consciousness, for how long who knows. I imagine there is a lesion somewhere deep in my brain that short-circuits every once in a while, sending an electrical storm through the whole works and instead of clicking “pay gas bill” – a simple task – I zone out and Google pictures of interiors of luxury jets. Fascinating, this notion that you can have this wonderfully appointed space – bedrooms, big TVs, bars, staircases – staircases! – 50,000 feet above our heads moving close to the speed of sound. But there I go again. Whatever the reason, here I am – loose on the planet without the benefit of a well-ordered mind. To some people that’s a liability. One guy looks down his nose and wonders why some other guy hasn’t done more – if only he would work harder, damn it. Well it’s not so simple. 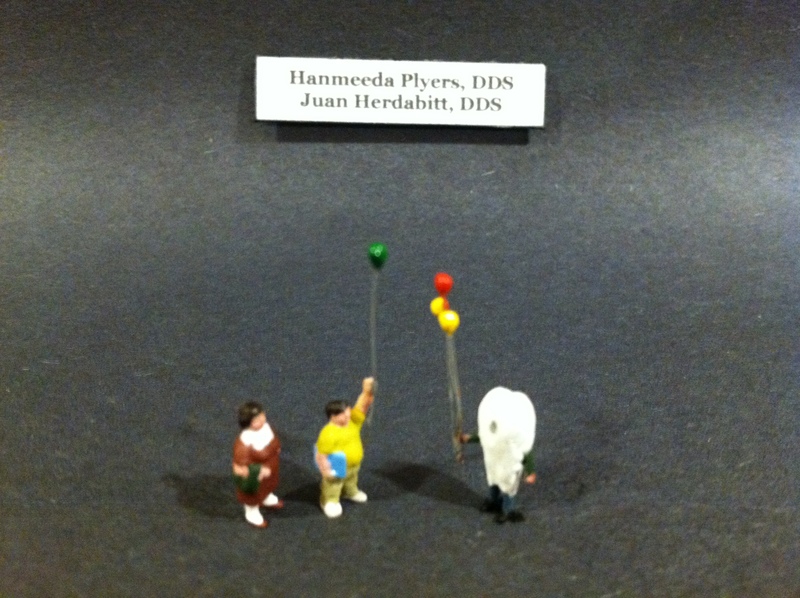 Some of us get to be astronauts, some of us cast about inside our chaotic minds. “All men are created equal” is a dangerous lie. Engineers and surgeons do critical work and I envy them – I can’t keep my head in the game long enough to accomplish anything so important. I’m not sure that’s for a lack of effort. Maybe it is. Anyway, so what? I do pretty good despite my infirmity. I support a really amazing family. I’ve held down continuous employment since the age of 16. I own a home, have an excellent credit rating, and generally get along with people pretty well. Except shuttle bus drivers. So let’s hear it for the dreamers, the short-attention-spanners. I work with people who sit in cubicles all day and seem perfectly content to do so. The world spins on around them – leaves fall, grass grows, birds chirp, dump trucks rumble and people create and build and make – and they’re missing it! I’m thankful to have work that lets me out a lot. I get to see it, absorb it, and in that freedom I find a very productive place. So I’ve been away from Salvation Point a while. I’ve missed it. I like it here. But I can’t say for certain how long I’ll stay.